There was a point in the early drafts where Keisha was so hurt by not being taken along, she did a heel-turn into villain territory. About 3/4 through the Truck arc I started thinking, "Christ, do I really want this revenge theme to keep being a thing?" Good plan. I MUST HAVE MY REVENGE gets kinda old, quick. I had my doubts at first, but I’m liking Andi more and more as a mom, cursing and all. Also, yay for posting after almost a year of lurking. Also, how dare spell check not recognize yay as a word! Spell check doesn’t recognize a lot of things as words. Like Abdicake, Strategery, Schadenfreude and Truthiness. They are all perfectly cromulent words that should be used more often. though, for some strange unknown reason, my spell-check has no problems with grok… huh? Whole lot of heartbreak. But I’m glad you didn’t have her do a face heel turn. I agree, and am relieved by the outcome. Yes and yes, but also wanting this to not be the end of the matter. I’m still on board with Todd’s parents adopting Keisha as the best idea I’ve heard so far. There was a time I was playing a tabletop RPG with my friends, and we were heading through a spaceship full of dead bodies that (surprise surprise) turned into zombies once the heat and gravity got turned back on. During an early battle, my front-line fighter guy got bit. I immediately demanded that they cut off the arm that was bit, so that I would not turn into a zombie myself. The team and even the GM attempted to persuade me that it was not that kind of zombie, but I insisted that if they didn’t do it, I’d do it myself. So we hit the medbay for a few minutes and I spent the rest of the mission hopped up on painkillers, with a penalty to combat. But at the end of the mission, I told the GM that I wanted to ensure that the loss of my limb meant something… that it wasn’t as easy as hitting the nearest space mall for a new body part. He responded by making the next mission about getting the funding for said replacement part. And, which I don’t think was planned, we suddenly had the rest of the team losing their arms in various incidents as well, until by the end we had taken on this sort of identity as the one-armed somethings or missing-hand somethings, I forget the exact phrase we used. Phantom Limbs? It’s good to have characters, even young characters, act in a way that shows they are capable of being unselfish. But it’s also worth acknowledging that even if you have a good, solid, logical understanding of the variables involved, you may not be able to force your emotions to follow suit. Maybe you’ll be crying your eyes out while trying to explain that you realize you shouldn’t be upset over this but you just can’t help it — things like that. So I hope this isn’t the end of the issue. You don’t sound like someone I’d want to play an RPG with tbh. Pretty rude to handicap yourself for no reason. Plenty of reason In Character he didn’t know about what type of Zombies they where. With zombie bites, better safe than sorry. Sounds like exactly the kind of person I’d want to game with. Someone who takes playing in character seriously, even when it’s a serious disadvantage to the characters. If all I cared about was pure success, I’d want a team of rules-lawyer min-maxers who would end up with an impenetrable goon squad. I, however, like role playing, so I’d greatly prefer a team of mismatched, semi-effective, interesting characters played well who do what they can with what they have. This. That min-maxing BS isn’t fun to play with. almost forgot that Lillian was there, nice save having her there to be ‘the bearer of bad news”. I like that Keisha really kinda knew it wouldn’t go that easy but still tried anyway because hey what if they say yes? Wow, I thought that could only end in disaster, looks like they both matured into accepting that they wouldn’t be able to be adopted together, well I dunno, maybe there’s nothing wrong with choosing to stay together throughout your childhood. I’m glad Keisha took it relatively well, tbh. I can see her being the villain for a while, but really, I think Amanda and Andi will have enough excitement for themselves working out their new relationship. Also, the obvious fireworks when Selkie and Amanda find out they’re sisters…. that whole storm other readers have been bracing for since the beginning. Also.. totally random here …I get the feeling Andi is gonna encourage Amanda to change her hair. I don;t know why I see this happening. Like.. the pigtails were all about “Parents LOVE pigtails, so I’m gonna wear pigtails, and be adorable, etc. etc. etc.” So, with Andi being all artisty and kind of alternative, I have this image in my head of her suggesting it as some kind of therapy/bonding thing. Like an “I love you no matter what, so be yourself” thing. And you KNOW that’s going to be a thing, because just look how A.M. is acting now. All eager to please and stuff? Yeah. That’s gonna have to be a talk. Calling it now. I think they’re going to be working on the basics for a while before even thinking about that. You have two people who hardly know each other and they need to understand who the other is before they make any changes. Yeah, Amanda needs some grounding in her life and Keisha’s been there for her all along. I really like this idea. I think having Andi and Amanda go in together for more mature haircuts would be a great visual way to show that they are starting a new life. Changing your hair isn’t that big a deal; Amanda could still go through various acting-out phases. However, as someone else pointed out a while ago, I LOVE the fact that Amanda’s pigtails mimic Andi’s formerly-blue strands. A standing ovation for Amanda Marie, though. She did try to keep her promise. Probably the best way it could have been done, for everyone. I think the fact that it came from an authority figure instead of Andi and was couched in terms of ‘she’s not allowed to’ makes it easier to swallow. This way it’s nobody’s fault, it’s just the rules. Yeah, thank goodness Lillian was there to take control of the situation before people went to pieces. Glad to hear about your change of heart. I also don’t think it would have been especially in character for Keisha at this point; having already gone through it with whatsername and been caught in the middle, it seems much more likely that she’d know better by now. and Lillian comes through again. This was a PERFECT way to let Keisha down easy and bring her back to reality, without making Andi the “bad guy” 2 minutes after Amanda meets her. That went… a LOT better than expected. These characters don’t usually get out of an intense situation this easily. Lilian in her wisdom did not allow the situation to become intense. Also, unless Mr. Warren decides one day to stick his figurative arms up his characters backsides and starts to wave them around like puppets, I don’t think we’ll come up with a equivalent invective anytime soon. I’m glad that you didn’t turn Keisha also into a villain… The comic will have enough “I want revenge” stuff when Amanda learns that his REAL father adopted her most hated rival instead of her! I wonder if the first Selkie is going to hear of this is when Amanda gets to the next school day and is all “My REAL MOM CAME BACK!” and Selkie’s all “nuh-uh, pics or its didn’t happens” and then Amanda’s “WELL, SHE’LL PICK ME UP” (depending on bus pass bureaucracy, this may be necessary for a few days) and then Selkie’s all “Dads, we gottas waits, I gottas sees this, Amanda says her reals moms gots her” and then there’s going to be the STARING EYES OF THE ADULTS. It’s gonna be a rough day for a certain dad. I hope this happens. So much. Whoa. . . I could totally see that happening. And yay, Lillian! She is a pro. I bet this isn’t the first time she’s had to deal with this kind of situation either. I wonder if Andi knew that Todd get HIS daughter from the same place HER daughter was. Because that would mean that she knew that he passed over his REAL daughter, in favor of some seal (Andi has never met her, I don’t think, but in the conversation with Todd just before he got the call about the stolen shirt, Andi finds out her name, says, “Like the seal people?”, and says that she is “one lucky seal”). Wonder which will be more drama. Todd finding out his daughter is alive, or Selkie and Amanda finding out they are sisters. That’s where I’m at too. While I’m trying to pay attention to this sequence, I cannot avoid imaging what kind of megastorm is going to be unleashed when Todd finds out that he passed over his own blood daughter to take the fish monster girl — and when Selkie and Amanda find out they’re sisters now. Honestly, Todd was adopted and chose to adopt Selkie. I can’t imagine him regretting his choice of Selkie at this point, fish monster girl or not. The bigger issue is that his daughter was alive all this time, and that Andi knew. Seriously, that were in a serious relationship for like 9 years and she never told him. Can you imagine finding out your partner kept this secret from you for that long? I know they’ve already separated, but dear god. How can Todd even be friends with Andi after this incident!? P.S. Selkie and Amanda go to the same class in school. There is going to be a disciplinary incident or parent teacher conference involving Todd, Selkie, Andi, and Amanda. There is no way Todd won’t ask about Andi’s change of heart on adoption. It’s not “if” this will come out. It’s “when”. There is a shitstorm a brewing. I’ve said it before, I’ll say it again… My guess is a severe overcorrection resulting from Amanda’s mistreatment at the hand of her brothers. Selkie is AMANDA’s sister. Only SHE gets to make fun of her. the rest of you? Expect righteous anger and furious vengence. I know Dave sometimes goes for The Drama, but this is more or less what I expected to happen. 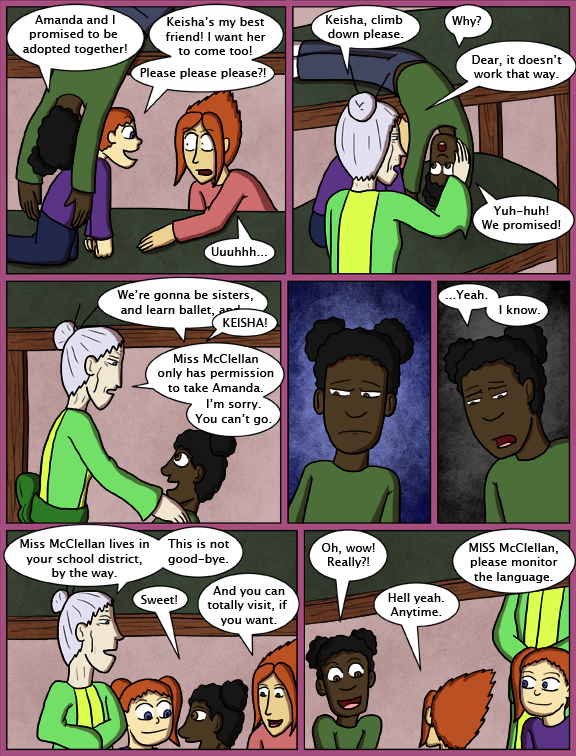 What I didn’t expect was for Lillian to phrase it “Miss McClellan only has permission to take Amanda”. In one sentence she easily defused the situation in a way that both Keisha and Amanda would understand and prevent Andi or Amanda from looking like the bad guy. In retrospect, Lillian probably knew about the “promise” all along and was thinking of the best way to handle it ahead of time. Re-reading this. I *love* the way Amanda looks in this page. It has to be one of the first times she looks like a happy little kid versus so angry and angst-ridden. Yeah, Amanda needs a good influence in her life anyway. Her new mother and Keisha should hopefully help. Having Keisha turn into a bitter ex-friend, while it would’ve caused some conflict that’s fun to read about, kind of keeps too much pressure on Amanda I think. Amanda has enough conflict within her own actions and personality. I really love the last panel, you can just see the admiration on Amanda’s face.. like “Yeah, my mom is great!”.. this really is a fairy tale come true for Amanda, especially after already having been adopted out and then rejected. Andi is her knight in shining armor, and even if she can’t adopt Keisha, the fact that she’s already willing to put Amanda’s desires and needs at the top of her list is a good inclination that she’s going to be a great mom. I’m also happy with the decision of Keisha not turning into a villain, because honestly it wouldn’t ring true with her character after already seeing how she handled the situation with Heather and Amanda.. plus, we’ve got lots and lots of drama heading our way with Andi, Todd, and Selkie. I have to say Dave, at first I was mildly interested in the comic.. I knew it had potential and I did want to stick with it to see your artistic ability blossom, but now it’s become my favorite web comic to read (and I read quite a few). The story has me totally engrossed and impatiently waiting for more at every update. You’re a fantastic story teller and the art will only keep getting better. I really, really love this comic. I can’t wait to see what happens next. This comic is unique among the ones I read. It’s about kids yet deals with mature subjects without pat answers; it’s something I can recommend to kids of any age yet the chat includes swearing (I ADORE the form of censorship employed). It’s heartwarming without being saccharine. It layers well-developed fantasy elements over a quasi-realistic modern world, yet the fantasy doesn’t take center stage. Its cast is highly inclusive: different races and cultures, sexualities and gender expressions, ages, body shapes, disabilities… yet, again, these aren’t the focus, aren’t in-your-face (the gender-expression character I didn’t even pick up on until I read the comments); they’re details of a developed world, a story set in a time when these things aren’t such a big deal because the people are first and foremost *people*. That, and the community here is one of the best I’ve run across. A few pages back we even managed a conversation about the evils of religion without devolving into a flame war — how many forums can you say THAT about? I was finding it strange that Keisha was allowed into this part of the meeting anyway. I thought it should have been private, between Andi and Amanda. But I’m glad Lillian was there to handle things as she did. I can still see fireworks when Amanda finds out who her biological father is, which is bound to happen sooner or later. Todd had no idea Amanda was his daughter; to him, choosing Selkie over her was no different from choosing Selkie over Keisha, or Moonsong, or any of the other orphans. I can see Amanda having a hard time understanding that, though. Finally, another poster has suggested that Todd’s parents should adopt Keisha. Since that would make Keisha Todd’s sister, wouldn’t she also be Amanda’s aunt? I doubt the plan was to have Keisha in the meeting but the falling down nap in the hallway interfered. I agree that it would be problematic if Todd’s parents adopted Keisha. First of all, Theo and Marigold are in a completely different phase of life – grandparents are all about having fun and spoiling their grandkids, while parents have to set boundaries and enforce rules. It would be very difficult for them to act one way with Selkie and the other with Keisha. Plus, the girls wouldn’t understand it. They would resent each other, especially if Keisha was technically Selkie’s “aunt.” Second, I understand that Keisha may be better off with black parents than with white Andi, but surely there are other black couples in Calumet City? Dave is already juggling a huge cast with aplomb; I’m sure he can introduce two more! I don’t agree that she would be better off with Black parents. I have never found it a compelling argument that a kid ought to be adopted by parents of the same racial background. It’s good if kids get a culture, but it’s not vital, and having kids raised by parents of different races just helps our society get a few steps closer to a society where race isn’t considered a big issue. That, and when I’ve heard of real-life adoption attempts getting rejected because the kid was Black and the people who wanted to adopt were white and the adoption agency decided it was better for the kid to *stay in foster care* than to go with a loving family who happened to be different from the kid’s natural race and culture… you have no idea how much rage that raises in me. Surely it’s better to have a loving family *of any kind* than to tread water in an unstable foster care situation waiting for the “right” parents to come along. I’ve always wondered about that. I’ve met children who are minorities in white families. From what I’ve seen, it works best when the parents make an effort to forge friendships and a community with families who are the same race as the child—as well as making sure the child is brought up in an environment that is accepting—either a really amazing public school or an inclusive private (Montessori or perhaps a Quaker-based school—I’ve heard good things about both). Well, I suppose it’s a little like parents of Deaf children who take pains to connect with Deaf adults so the child can get the support they need. And yeah, inclusive environments can help, as can homeschooling for a while before getting into the peer-pressure environment (so you build up a sense of confidence, competence, and self-worth before the world can try to knock it down). But really — and I’m probably showing some pretty extreme ignorance here — I would think that the only thing a Black parent could provide a Black child that couldn’t be provided by a white parent is the “I know how you feel” about prejudice and a lifelong discussion of ideas for how to deal with it (both externally — how to avoid getting hurt, how to stand up for yourself, etc. — and internally — how to cope with the emotional effects of abuse of that nature). The rest of it is just… parents raising kids, same as anybody, except that they look a bit different. It’s not like white kids are never bullied or ostracized for aspects of themselves that they have no control over. i wonder. birth certificates generally list the parents. andi may have given them ‘father unknown’, but if not lillian may well have seen the certificate, and with amanda brought to her specific attention and recent interactions with todd, i wonder if the dime will drop for her before todd gets the scoop and if so, what she will do with the knowledge. So Lillian is almost certainly going to be as blindsided by the revelation as anyone else, unless Andi mentioned it off-screen. Yes, I was wondering, but then came to the same conclusions as A.Beth. Legally, Andi shouldn’t have been able to release Amanda that easily without Todd’s signature (definitely not without his knowledge) if she included him in the records. And I just found out recently, some states (ex – VA) still require a woman to put a father on the record. This can be easily gotten around if you are lucky enough to have a good male friend who is willing to sign it. Just a random note because nobody else has said it yet, but the way Lillian went “MISS McClellan” really made me giggle. Way to sound just like you’re scolding one of the children, Lillian. I have been waiting for this. 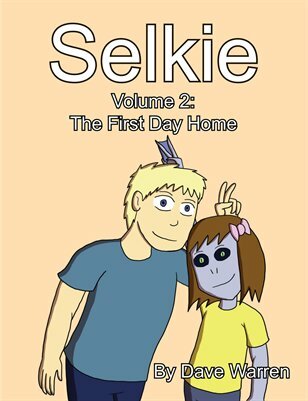 I got to say, out of all the webcomics I read, and there are a few, Selkie is the one I wait for every Mon, Tue and Fri. There are so many times I recheck a comic on Tuesday or Thursday and forget they don’t update then. Dave, keep up the good work! On that note, I got to say this storyline as made me squee far too many times. I am glad something good is happening for this little girl, who just wants someone to love her. I was at first concerned that Andi was just doing this as some sort of guilt ridden decision but seeing her interact with Amanda (oops, I mean Amanda-Marie), she genuinely wants to get her daughter back. What may have prompted it was guilt, but now, she’s doing it for love and you can see that. She isn’t cowing down to Amanda, but trying to show that she can help her. Cannot wait for next Monday! the way he’s trolled stuff before, intending to incite hate and discontent on the board about minor things in the comic, i’d say he’s talking about himself. Well if you’re looking for events that are incredibly stupid, the man with two black parents one black brother and one hispanic sister claiming he “can’t stand colored people” would certainly be up there. Marta is Hispanic?!? huh, learn something new everyday… to me she looked more Asian than Hispanic… not that i care, it’s cool either way.